"There are sandwiches, there are sandwiches with eggplant... and there are Eggplant Sandwiches! Who needs bread anyway?" Preheat the oven to 450 degrees F (230 degrees C). Coat two large baking sheets with olive oil. In a medium bowl, stir together the panko crumbs, salt and 1/2 teaspoon pepper. In another bowl, whisk together the egg and water. Place the flour in a third bowl. Coat each slice of eggplant with flour, shaking off the excess, then dip into the egg, and finally coat with panko crumbs. Place on the oiled baking sheets. Bake for 12 minutes in the preheated oven, then turn over the slices and bake for an additional 12 minutes, or until golden brown. Remove from the oven and cool slightly, but leave the oven on. While the eggplant is baking, heat 1 tablespoon of oil in a skillet over medium heat. Add the onion; cook and stir until almost tender, then add the garlic. Cook for just about 1 minute. Remove from the heat and stir in the goat cheese, provolone cheese, parsley and basil. Season with pepper. Divide the cheese mixture among 8 slices of the eggplant (half). Spread to cover, then top with remaining eggplant slices, pressing to compact. Return to the baking sheets. Bake in the preheated oven until eggplant is crisp, about 15 minutes. Place two sandwiches onto each serving plate, and drizzle with pomegranate molasses. 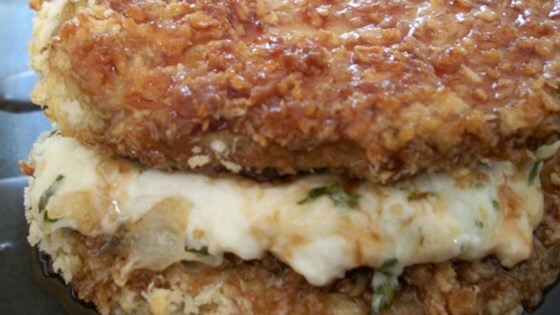 See how to make eggplant sandwiches stuffed with salami and cheese. Made some changes but totally awesome recipe. Added sauteed spinach, and tried a instant potato coating. Its the bomb. No pomegranate molasses but I'm very happy how mine turned out. I modified my recipe by adding sauted squash and mushrooms to my "sandwich."